What direction should your solar panels face? | West Coast Solar, Inc.
What direction should your solar panels face? Most solar panels are installed on south-facing roofs (if the house has one), as this puts them in a position to receive the most direct sunlight over the course of a year. Because we live in the northern hemisphere, the sun tends to move across the southern portion of the sky, particularly in the winter months. But a new study released by the Pecan Street Research Institute states that solar panels that face west can produce more electricity during afternoon hours, when the grid is trying to meet peak demand. The report analyzed the power output between June 1 and August 31, 2013, from 14 solar installations that were pointed west and 24 that were pointed south, all of which were located in Austin, Texas. 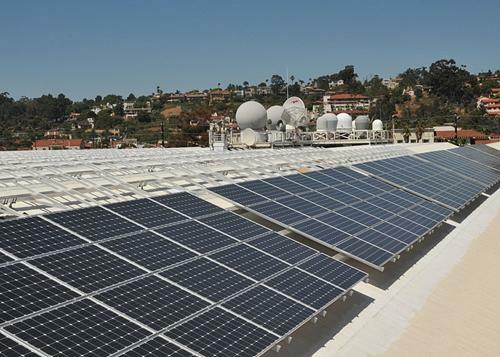 They found that the 14 west-facing panel arrays generated 49 percent more electricity during peak demand hours. Becauise that is the time of day when electricity rates go up, the power produced is technically more valuable to the electric company. Whether or not the utility actually pays more for power produced during those hours can vary. Not all companies change their net metering rebates based on demand. As Forbes Magazine notes, it may be beneficial for the electric company if more of its customers’ solar panels are pointed west, but most utilities have not structured their rates to reflect this fact. At West Coast Solar, we can design a Bay Area solar panel system for your home that provides the biggest financial benefit possible. We’ll work with the structure of your home to construct a photovoltaic panel array that meets your energy needs and helps you save thousands of dollars on your electric bills. Contact us today to schedule a solar site analysis.